A brand new facility on Discovery Place Science’s uptown campus, the Education Studio has state-of-the-art meeting spaces perfect for brainstorming, break-out sessions or group. The main area comfortably seats 30 at round tables of 5. The space is equipped with white boards and a flat screen smart board for PowerPoint presentations or films. Break-out spaces are available on both sides of the main space. Perfect space for presentations, speakers and discussion panels. Discovery Theatre offers exceptional audio/visual capabilities in a comfortable state-of-the-art environment. Take advantage of the large screen by showing your own pre-approved film. 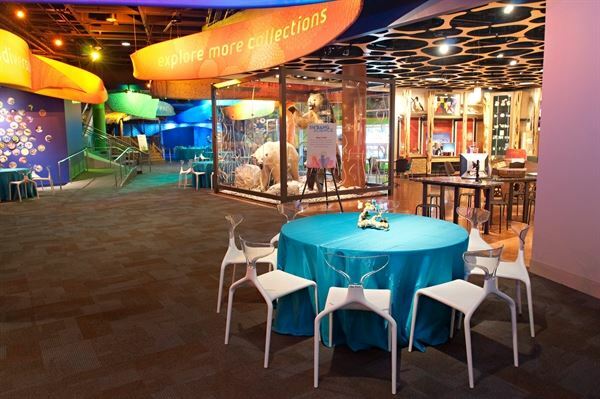 The Museum's award-winning World Alive exhibition featuring the Aquarium and three-story Rainforest make Level 1 ideal for cocktail receptions, smaller seated dinners or team building activities. Special Features: Explore More Life Lab with touch-tank. One of the most vibrant and interactive locations in the Museum, Level 2 is packed with ever-changing exhibits and experiences. The options are endless for ways to program an unforgettable event. We suggest adding on an animal program or live science demonstration for a fun and dynamic experience. Special Features: Explore More Stuff Lab and Explore More Me lab. An imaginative and innovative space, Level 3 features the inventive Think It Up exhibition and the accompanying Thinker Space, the Museum’s design lab. Perfect for creative cocktail parties, team building activities or group gatherings. Every rental comes with a standard activity in the lab, or take your evening up a notch by adding a specialized activity. Arguably one of the best meeting locations in the city, Windows on Tryon offers the latest in technology in a bright open space sure to inspire innovation and collaboration. Plus, your guests have direct access to the beautiful outdoor patio space nestled on Tryon St. Chairs and table in this space are mobile and space comes equipped with a Smart Board. Special Features: AV: Projector, Smart Board, Phone, Speakers. White boards, Mobile tables and chairs.